The 2015 CBMS Survey is now available. Last month I reported on Trends in Mathematics Majors. This month I am looking at what has happened to enrollments in particular mathematics courses. The column has three section: Enrollments by Category, where we see that the fastest growing category is Advanced Undergraduate Statistics; Calculus Enrollments, noting that the growth here is almost exclusively within the research universities where it is tied to the strong growth in engineering enrollments; and Dual Enrollment, where the story is about the dramatic increase in four-year institutions now offering dual enrollment courses. The first graph (Figure 1) shows strong growth in course enrollments in 4-year undergraduate programs, exceeding 2.5 million for the first time. This is certainly tied to the rampant growth in the number of prospective STEM majors (Figure 2). The number of prospective engineering majors grew from 108,000 in 2005 to 156,000 in 2010, peaking at 194,000 in 2015. Over the same period, prospective physical science majors grew from 30,000 to 40,000. Students entering with the intention of majoring in the mathematical sciences grew from 10,000 to 16,000. Figure 1: Undergraduate enrollments by course category in mathematics and statistics departments at 4-year institutions. Intro Level includes College Algebra and Precalculus; Calculus Level includes sophomore courses in linear algebra and differential equations. Figure 2: Number of entering full-time first-year students at 4-year institutions intending to major in five core STEM disciplines. Data from The American Freshman, published by the Higher Education Research Institute. The most remarkable growth among categories of courses was for Advanced Statistics, any course beyond a first college-level statistics course, almost doubling from 60,000 in 2010 to 110,000 in 2015. This is in line with the growth in the number of Bachelor’s degrees awarded in Statistics, from 858 in 2010 to 1509 in 2015. Figure 3 shows that this growth has occurred primarily within departments of statistics, although there has also been strong growth at Bachelor’s level colleges and a remarkable turnaround in Master’s granting universities. Figure 3: Enrollments in Advanced Undergraduate Statistics by type of department. Departments of mathematics are characterized by the highest degree offered by the department. Calculus enrollments have also seen strong growth, driven by increases in prospective STEM majors (Figure 4). The MAA Progress through Calculus study found that for mainstream Calculus I, fall enrollments account for about 60% of all mainstream Calculus I enrollments throughout the year, while fall Calculus II enrollments account for about 40% of all Calculus II enrollments. Thus, about 550,000 students study Calculus I each year at a post-secondary institution. This compares with roughly 800,000 students who study calculus in high school each year (NCES data). 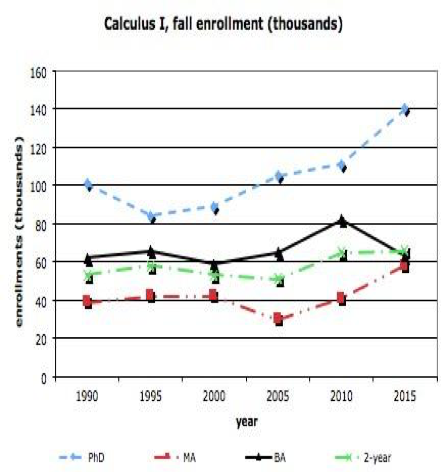 Figure 4: Fall term mainstream calculus enrollments (meaning that they lead to the usual upper division mathematical sciences courses), combined from all 2- and 4-year institutions. Supporting the claim that most of the growth in calculus enrollments can be attributed to the growth in prospective engineering majors, Figures 5–7 show that the increase in calculus enrollments has occurred at the universities that also offer a PhD in mathematics, predominantly the large research universities. 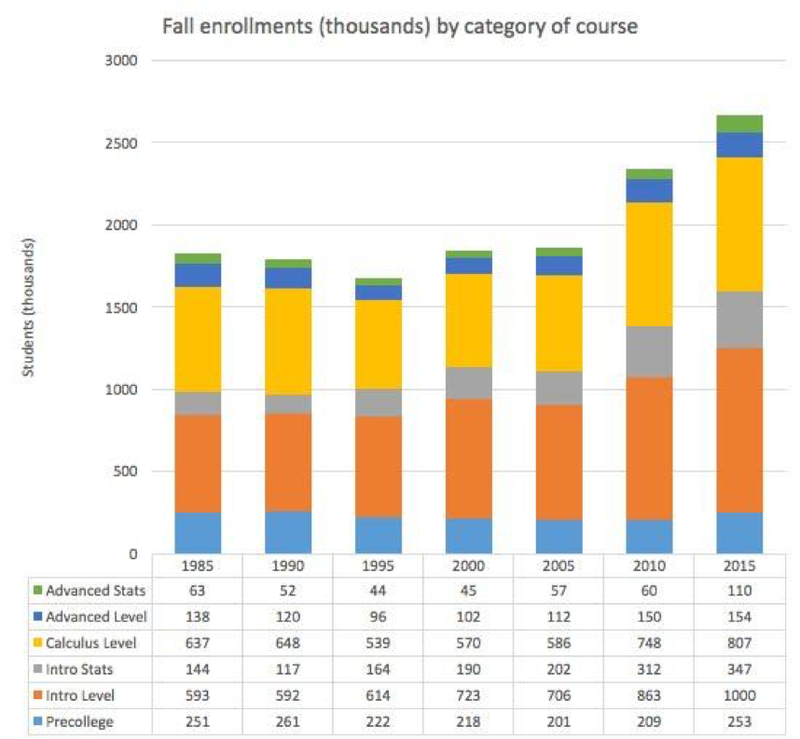 Figure 5: Fall enrollments in mainstream Calculus I, by type of institution. Figure 6: Fall enrollments in mainstream Calculus II, by type of institution. Figure 7: Fall enrollments in mainstream Calculus III&IV, by type of institution. The connection to engineering is reinforced by an interesting though not surprising observation. 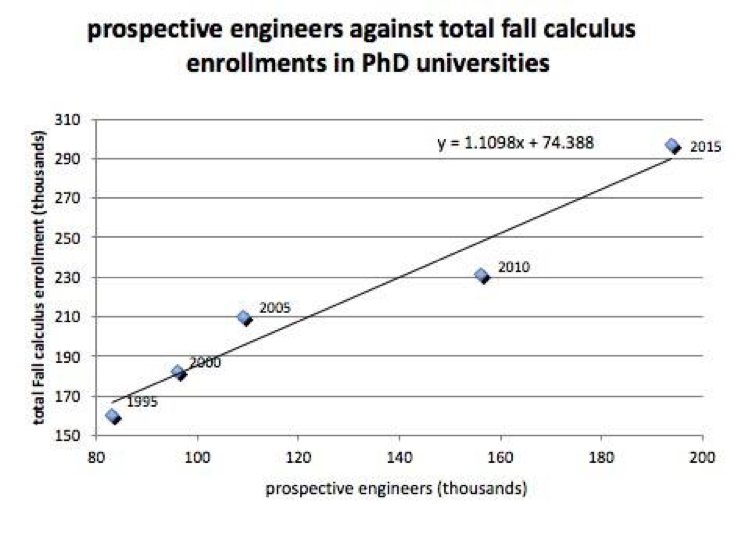 In 2005, I plotted the number of prospective engineering majors against the total number of students enrolled in all mainstream calculus classes (single and multi-variable) in PhD-granting departments (Figure 8). The correlation, at slightly over two students enrolled in the fall for each engineering major is remarkably tight, with a Pearson r=0.99. Figure 8: Number of entering freshman intending to major in Engineering against total fall enrollment in all mainstream calculus (single and multi-variable). The 2010 and 2015 data do not come close to fitting this line. It overestimates calculus enrollments by about 35%. Fitting a line to the data from 1995 to 2015 yields the graph in Figure 9. The multiplier effect of each prospective engineer has dropped to a little over 1, evidence that whereas an engineering major would, in the past, study single or multi-variable calculus in two fall terms, they now usually take calculus in only one fall term. Figure 9: Number of entering freshman intending to major in Engineering against total fall enrollment in all mainstream calculus (single and multi-variable). CBMS began tracking dual enrollment in 2005, courses offered by a 2- or 4-year college, taught in a high school by a high school teacher, but carrying both high school and college credit. In 2005, 50% of 2-year departments, but only 14% of 4-year departments offered dual enrollment courses in mathematics. By 2015, these percentages had climbed to 63% at 2-year institutions and 26% at 4-year institutions. We conclude this column with Figures 10 and 11, showing the number of fall enrollments in the four most common dual enrollment courses: College Algebra, Precalculus, Calculus I, and Statistics. Figure 10: Fall term dual enrollment at 2-year colleges. Figure 11: Fall term dual enrollment at 4-year institutions. Read the Bressoud’s Launchings archive.